A few days ago I had a breakdown, an old-fashioned tantrum complete with tears, yelling, and stomping around my apartment. All because I needed water and there was none to be found. I haven’t had water in my apartment for exactly 6 days now, and I’m just plain tired of it. It gets to you after awhile – it plays with your emotions. I can’t bathe. I can’t use the bathroom. I can’t clean. I can’t do anything. I have to leave my house to complete my daily routines. I never thought I wouldn’t have access to water, a basic necessity. It never crossed my mind. Maybe it’s because I’m a spoiled American. I’m used to getting what I want. Where there’s a will there’s a way, right? Not always is what I’m finding out. It’s such a hard lesson to learn, and I’m having trouble dealing with it. It makes me mad, it makes me act like a child, and it makes me delirious. I want clean water, and I want it now. I realize this is something that I signed up for, but it doesn’t make it any easier. Every day, local people carry 25 liters of water on their head, for miles and miles, in the hot, unrelenting sun. Every day, people reuse and recycle water because not even a drop can afford to be wasted. They wash their clothes in small buckets, and then use their laundry water to wash the floor. Water is precious, and not easily obtained. Sometimes life just isn’t fair. We carry SmartWater, Evian, and FIJI in our purses while some of my neighbors don’t see a drop of clean water all day. Why do we have an abundance of water in America and here, we have a contaminated, sparse amount of water? Shouldn’t we all have a basic, human right to clean water? It makes me feel sad with all our abundance of resources in America and people throughout the world are going without basic necessities. We just left Roan Mtn. , NC, where there is a clear, fresh stream of water running noisely down the almost every valley. I wish Krista and here friends in C. Verde could be here. I would get a bus and take them all to the mountain and after playing in the stream we would all come home and have a big cookout on our deck. We are truly blessed. But mostly we’re blessed to have great kids like Krista and Tyler. We miss you so much!!! You are a blessed American, not a spoiled American. If you were spoiled, you would not be sharing your heart as a member of the Peace Corps. Hope the water issue is soon resolved. 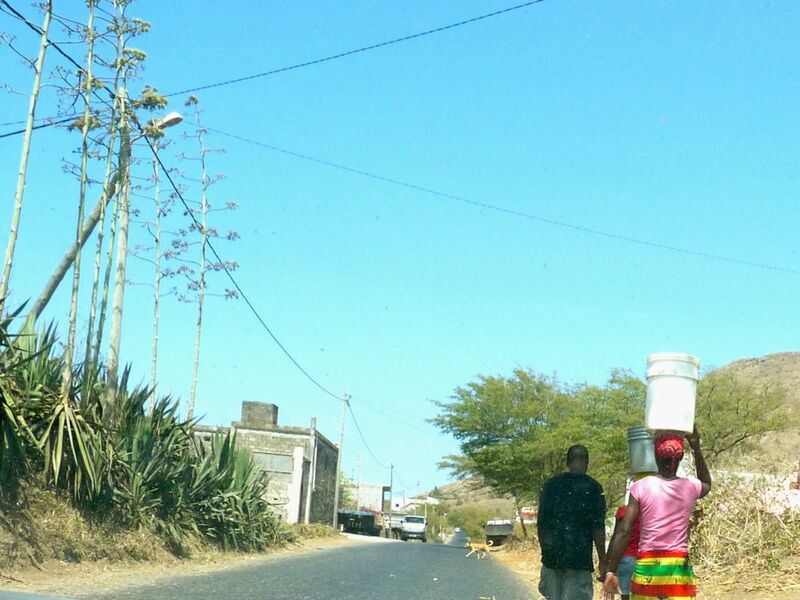 Krista, I happened upon your blog while looking for current contacts in Peace Corps Cape Verde. My name is Hadley Bachman, and my husband Brett and I served in Cape Verde from 2003-2005 in Tarrafal as education volunteers. Since our return to the United States, I have settled in Columbus, OH and am currently a teacher at Graham Expeditionary Middle School, an Expeditionary Learning school serving inner-city youth. We arrange our teaching in learning “expeditions,” trimester-long, cross-curricular close studies of a particular topic. This fall we are studying European Colonization of West Africa with a particular focus on Cape Verde. I am excited to embrace Peace Corps’ third goal and share my love of Cape Verde with my colleagues and students. We have several ideas to help bring Cape Verde “alive” to the students, and for some of these, I will need some help from local contacts in Cape Verde. This might make an excellent secondary project for you or another volunteer. Please email me at brettandhadley@gmail.com if you are interested in being involved or have advice about another volunteer who would be interested. Thanks!